Virginie Houdet has created a delightful deck of playing cards with original designs based on the traditional canon. “Nourrie par les anciens, elle poursuit son aventure poétique dans le présent.” The logical order and symmetry of the deck has been respectfully and imaginatively reassembled with new colours and a poetic spirit. The primitive geometric designs derived from woodblocks are refreshed in an intelligent and aesthetic harmony. Above: every card is an original watercolor and ink drawing. The 40 pip cards are each differently coloured in a readily comprehensible format. “Colours allow invisible emotions to express, enable things we can’t say to be seen. ‘Art does not reproduce the visible but makes it visible’ Klee said.” - V.H. 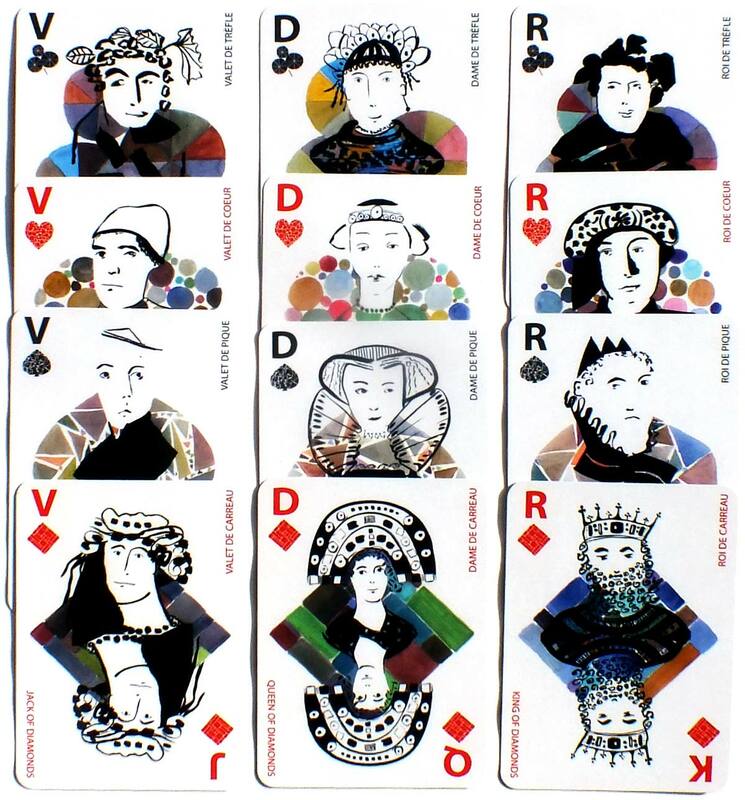 Above: the 12 double-ended court cards suggest personalities with underlying emotions and feelings, against a suit symbol in the background. As can be seen in the bottom row, the indices are bi-lingual: English at one end, French at the other end.